result = solvepdeeig(model,evr) solves the PDE eigenvalue problem in model for eigenvalues in the range evr. Solve for several vibrational modes of the BracketTwoHoles geometry. The equations of elasticity have three components. 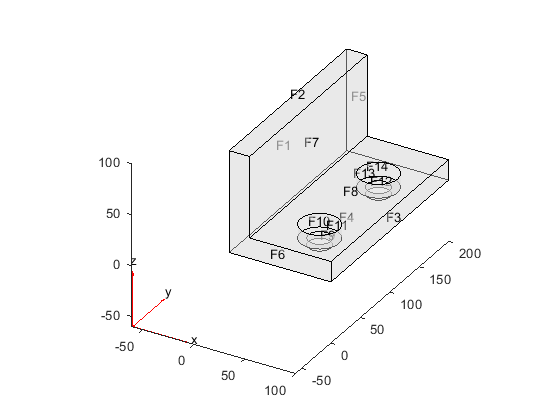 Therefore, create a PDE model that has three components. Import and view the BracketTwoHoles geometry. Set F1, the rear face, to have zero deflection. 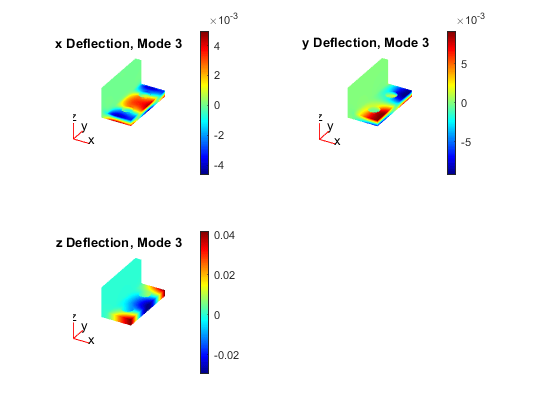 Set the model coefficients to represent a steel bracket. 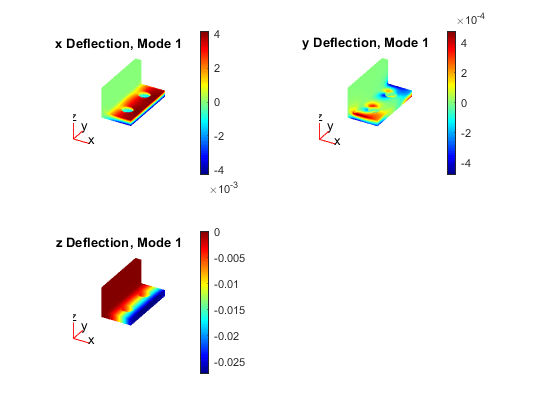 For details, see 3-D Linear Elasticity Equations in Toolbox Form. Find the eigenvalues up to 1e7. Mesh the model and solve the eigenvalue problem. How many results did solvepdeeig return? Plot the solution on the geometry boundary for the lowest eigenvalue. Plot the solution for the highest eigenvalue. Eigenvalue range, specified as a two-element real vector. evr(1) specifies the lower limit of the range of the real part of the eigenvalues, and may be -Inf. evr(2) specifies the upper limit of the range, and must be finite. Eigenvalue results, returned as an EigenResults object. The equation coefficients cannot depend on the solution u or its gradient.